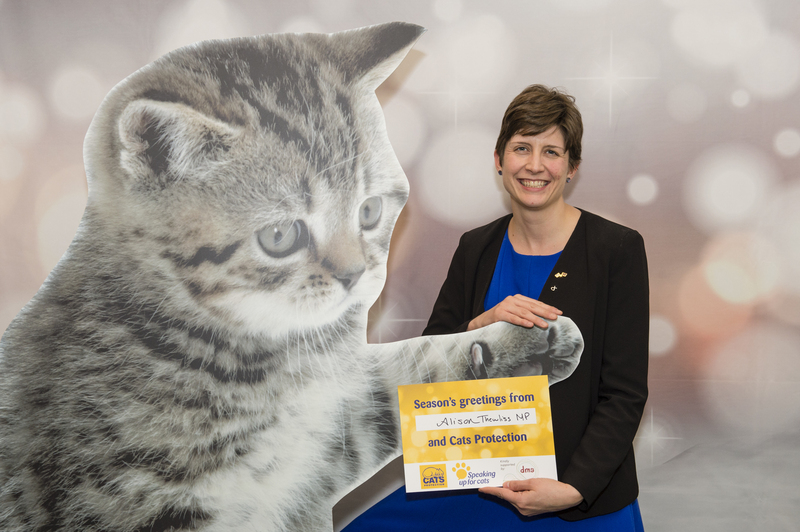 Alison Thewliss, SNP MP for Glasgow Central, joined other politicians at a parliamentary reception to celebrate the work of Cats Protection and help the charity come up with names for unwanted cats that come into its care. The event, held at the House of Commons on Wednesday, was hosted on the charity’s behalf by Sheryll Murray MP to highlight its work in campaigning on issues affecting cat welfare in the UK. Cats Protection is the UK’s largest cat charity, helping around 200,000 cats every year through a network of over 250 voluntary-run branches and 32 centres. “I was delighted to help Cats Protection League come up with names for unwanted cats and learn about the growing kitten breeding industry in the UK. “I and my SNP colleagues take animal welfare seriously and the SNP-led Scottish Government has implemented Animal Dealers regulations in Scotland, which places sensible restrictions on the sale of cats and dogs and protects the welfare of kittens and other pets. I hope the UK Government will adopt similarly proportionate and sensible measures to protect animal welfare across the UK. “Cats are one of the nation’s favourite pets so it was wonderful to welcome so many politicians to discuss how we can improve feline welfare in the UK. “Sadly, despite their popularity, we see huge numbers of cats and kittens coming into our care every year. Cats Protection works tirelessly to tackle the root of the problem, by promoting neutering and offering advice and information on responsible cat ownership. “This year we have also launched our True Cost of Kittens campaign to highlight a growing kitten breeding industry which frequently puts profit before welfare. As part of this campaign, we’ve been calling for a change in the law to better protect kittens and cats from poor breeding practices that frequently lead to serious health issues. “Throughout the year, we have been asking MPs for their help in pushing forward these changes which will greatly improve the welfare of cats in the UK. So this Christmas, we thought we’d ask them to get involved in one of the more creative and fun areas of our work – coming up with names for the cats in our care.